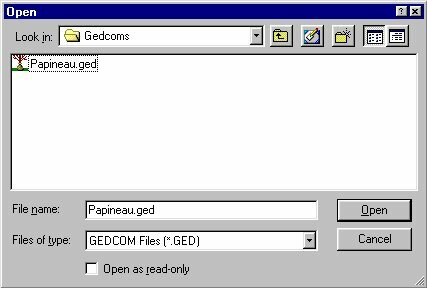 This is where you specify the GEDCOM file that you will be importing (reading from). This is a file on your hard drive, that was created by whatever genealogy program you use to store your information. This is probably not the file that your genealogy program uses, but a file that it can create. In my example, I named the file PAPINEAU.GED. Yours will not be named the same, but it will have the .GED extension. If you don't want to type in the path, you can use the Search button to allow windows to help you find the file. Click here for more information about and a better description of GEDCOM files. When you press the 'Search' button next to the edit box for 'GEDCOM file to read from', you will get this popup dialog. You use this to navigate to the directory (folder) where you GEDCOM file is located. Then you click on the file once to select it. Then press the open button. This will put the file path and name in the 'GEDCOM file to read from' edit box. These radio buttons allow you to select the file extension for your HTML files. This makes little difference to the creation of the files. But some people have a definite preference, so I allow you to select which you want to use. This is where you specify which languages you want to create webpages in. You can select any or all of the languages available. Only two of them are displayed here, the others can be found by pressing the 'Other Output Languages' button. Each language must have a different name for the base page, and you can specify the base page name for each. Follow this link for a full explanation of the other output languages. Follow this link for a full explanation of the General Settings. Follow this link for a full explanation of the Optional Pages. Follow this link for a full explanation of the language dialog. When you create your web pages, you need to have somewhere on your computers hard drive to store them until you are able to upload them to your website. This dialog allows you to specify where (on your computers hard drive) you place the files it creates. All files created by GED4WEB will be created here. In this example, the files will be created on my computers D driver in the directory MyHTMLFiles. You can not specify the address of your website here. 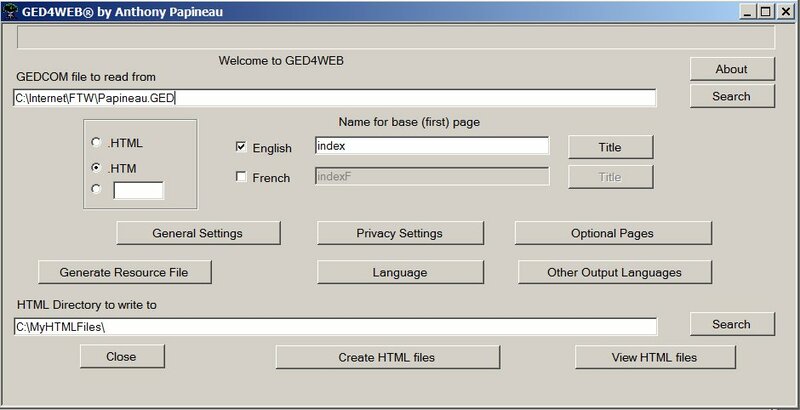 GED4WEB does not copy the file to your website. There are plenty of FTP programs available for free on the internet. If you don't want to type in the HTML Directory to write to, you can press the search button and navigate through your computer's hard drive(s) and select the directory that way. When you are done using GED4WEB press the close button to close the program. 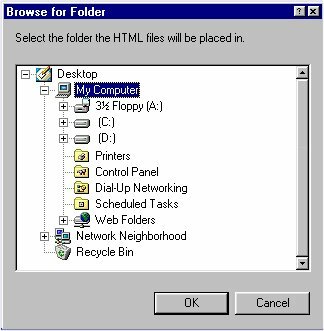 After you have all the settings the way you want them, press the Create HTML Files button and watch as GED4WEB creates your files. You will see a status bar appear and keep you updates as to the progress of the file creation proccess. After the files have been created. Press the View HTML Files button and GED4WEB will launch your default web browser and load the main (base) page. From here you can navigate around your new web pages.